To find the Windows 8 or 8.1 fonts e.g open the fonts folder, please start the MS Explorer to install or uninstall the Windows Fonts! 2. Enter the address: shell:fonts or WINDIR%/Fonts (C:\Windows\Fonts)! Via drag and drop or copy paste, add ergo install the new fonts for Windows 8/10 and 8.1, or ctrl+x uninstall! (Image-1) Find the Windows 8 and 8.1 fonts and the fonts folder! The solution ergo instruction, is a example to find the fonts and the fonts folder, it is written for Windows 8 & 8.1, however, you can use this example as a solution also for earlier Microsoft's Windows operating systems whether it's a Windows desktop, or Tablet-PC or even a server operating system and Windows. It has been tested on all and successfully verified. 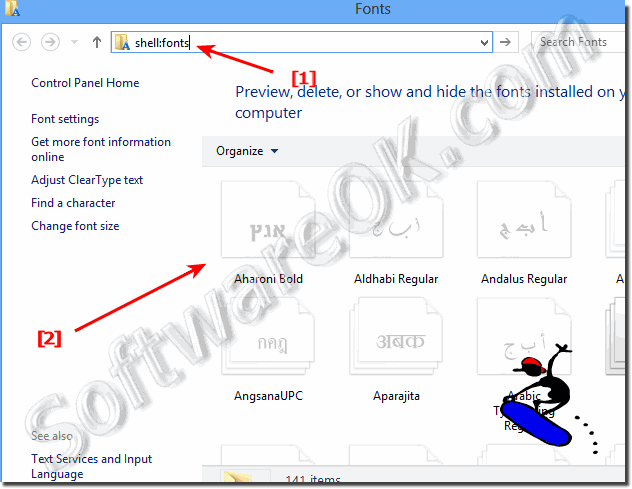 Windows-8 - FAQ-87: How to find the Windows 8/8.1 fonts and the fonts folder? To Safely Remove USB drives via a Windows 8 desktop shortcut, , please press the Windows 8 Shortcut [Windows + D].to see the Windows-8 Desktop see Image-1.